On Monday, we got the first produce basket that we had been able to order in a while now. We got a great variety of fruits and veggies, all of which were items that we like. No creative uses for unusual veggies this week! 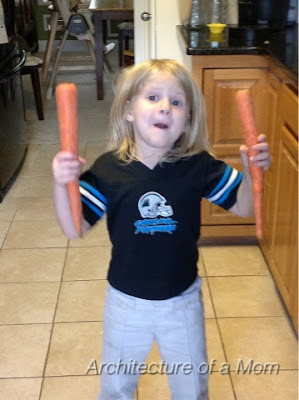 However,we got a lot of carrots. And when I say a lot, keep in mind that I already had some baby carrots that I bought to have down at the beach. These produce basket carrots are not baby carrots. Oh, no. These are jumbo-giant-crazy huge carrots.You see what I mean? Unfortunately, one of the few things that the babies aren’t quite ready to eat is hard food. One baby has only 2 teeth, after all! Raw carrots being too hard for them to digest, I started looking around for a recipe to, well,soften them up. I found this simple recipe from cooking light on myrecipe.com, but I was looking for more to flavor the carrots than just salt and pepper. I did like the high temperature, low time allotted for this recipe, though. Preheat your oven to 425. Line a cookie sheet with an edge with foil or parchment paper. Place a cooling rack on the pan. Spray cooling rack with cooking spray. Whisk together all remaining ingredients except the carrots. Add carrots and toss well. Place on cooling rack. Bake for 20-30 minutes or until desired doneness is reached. 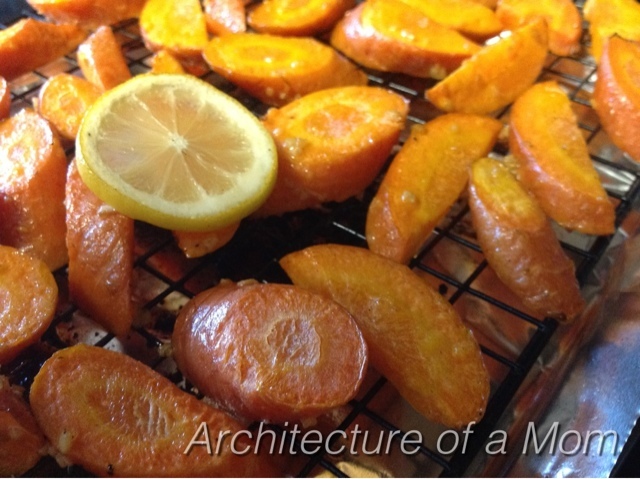 Not only does roasting carrots makes them softer, it also makes them sweeter. And since my eldest loves lemons, we put sliced lemons on top of the carrots in the last 5 minutes. Yum!! Sometimes I link up at the following places: Eat at Home, FridayFood atMomTrends, Slightly Indulgent Tuesdays at Simply Sugar and Gluten Free, Hooking up with Houseof Hepworths, I Should Be Mopping the Floor, The Finer Thingsand I Dream of Clean’s Spring Cleaning Challenge, The King's Court IV's What's Cooking Wednesdays, Meatless Monday at Hey What's for Dinner Mom, Finding Joy in My Kitchen, and Organizing Junkie's Menu Planning Monday. Your roasted carrots look yummy and sound so flavorful! These look great! I'm gonna certainly give them a try! Thanks for sharing!